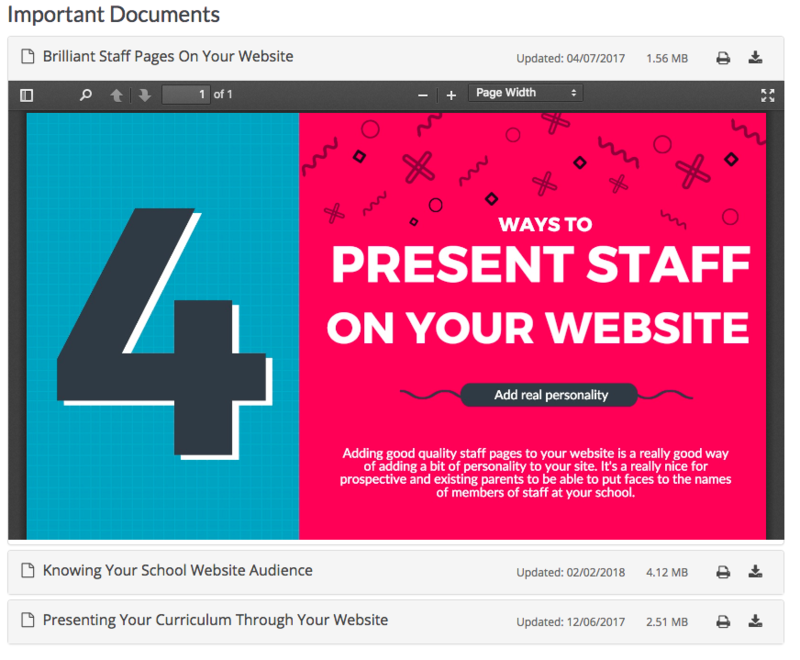 The documents module has been specifically designed for adding groups of documents to your website in a simple and attractive way. The most popular implementation of this is for policy documents and newsletters. To effectively use the document module, a Group should be setup first. You can do this by going to Embed Codes >> Document Groups. Click the + Create New button to create a new Group of Documents. These groups could be as broad as policies, or as small as Behaviour Policies, but not limited to policies. It can be used for any types of document used on your site to be displayed in this way. You can create as many Groups as you like. Enter the group name for your group of documents. This can be as broad as 'Policies'. However we recommend you split your document groups into smaller categories, for example 'Behaviour Policies', 'Admissions Policies' etc. A sort order should also be selected for your document group. 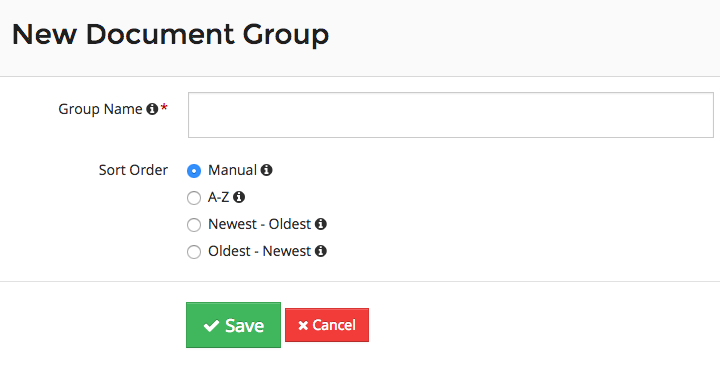 This sort order controls how the documents will be output within the group on your website. You can change the sort order at any time by editing the document group. Now we need to add a document to the Group we have created. Click the green + Add Document button within the document group page to add a new document to that group. After clicking the green + the new document form will appear, fill this out to add a new document to the group. Below is an explanation of the fields on the New Document details page. If you click 'Select' you will be taken to the File Manager. Click Select and then either select a file you've already uploaded or click the purple upload button to upload from your computer or tablet. Simply select the file by clicking the name in File Manager. 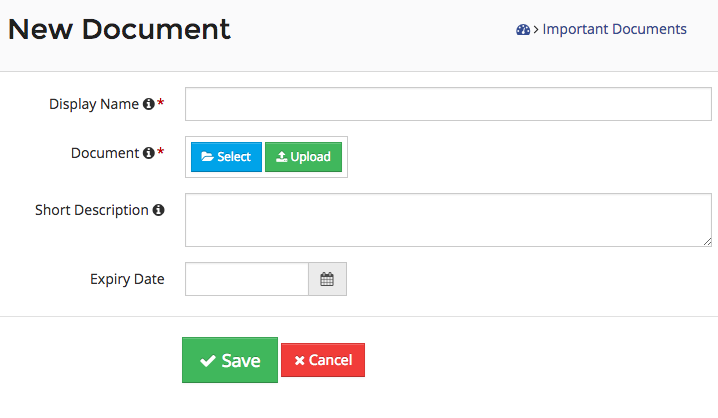 If you click Upload, you can upload a file directly into the document group. The document file that is being uploaded. This file should be a PDF file. The title to display for the document when it is displayed in the content of the website. An optional description of the document being added. Click Save and the document will be saved and added to the group. Add a date and save and the document will be eligible for reminders. To update a document that has already been added to a group, load the document group then click the blue pencil button next to the document to be updated. After clicking the blue pencil, the document form will appear, click select or upload in the Document field to choose a new document, and after saving it will be replaced in the group and wherever the group is embedded on the site. You can use the embed code in as many locations as needed. You can access all the embed codes by clicking on the expandable box called under the content box titled embed codes. Simply copy and paste the embed code provided for the document group, and all the documents within that group will be added to the page. Add multiple embed codes to a page to display different groups on a single page. The embedded document group displays lots of information available for the visitors to your website and also allows them to quickly read through the documents without leaving your website, just by clicking the document name.